Machinist Mate 2nd Class-PO2 John O. Brown, Jr.
​John O. Brown Junior a.k.a. "Jack" grew up in Pennsylvania in a U.S. Navy Family with over 135 years of combined family service. He graduated from Indiana High School as a State Football Champion in 1962. 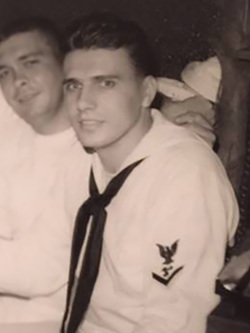 After graduation, he enlisted into the U.S. Navy and became a Machinist Mate, Second Class PO2 aboard the U.S.S. Kearsarge (CVS-33). He served 2-1/2 tours during the Vietnam War and visited many ports throughout the Pacific that includes Japan, Hong Kong and many others. Jack has been a Lakewood resident since 1979 and a proud Navy Veteran. Next to Jack's brick, lays his son's brick to the right of him. John O. Brown Jr. lives in Lakewood.